Geneva, Oct 24 (IANS/WAM) The United Arab Emirates (UAE) has pledged $7 million to support efforts aimed at easing the suffering of the Rohingya Muslim minority and improving their living conditions. The announcement was made on Monday at the “Pledging Conference on the Rohingya Refugee Crisis” at the UN headquarters here. Minister of State Maitha bint Salem Al Shamsi expressed her appreciation to Bangladesh for its humanitarian stances following the mass exodus of over 600,00 Rohingya fleeing violence in Myanmar’s Rakhine state. She said the atrocities committed against the Rohingya was not only about refugees or displaced people who left their homes in search of security, but “they were crimes that involve the killing and displacement of tens of thousands of innocent people, who were and are deprived of their basic rights in their own country”. The UAE asserted the need for the international community to take a unified stance and immediate action to stop these practices, and hold those responsible for them accountable, she remarked. The minister affirmed that UAE will continue to monitor and follow-up on the condition of the Rohingya and support the efforts of international organisations fulfilling their humanitarian duty. The conference has succeeded in receiving monetary pledges worth $335 million. 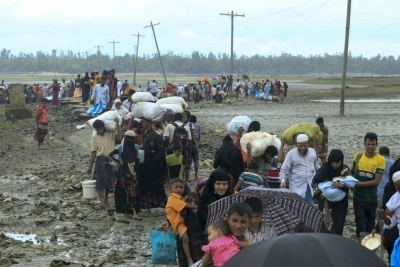 The total value of humanitarian needs of the Rohingya refugees for a period of six months has reached $434 million.